As of January 20, 2017, the most powerful nation on Earth will be governed by the least qualified and most unprincipled citizens in the land. It did not take long for Trump to be accused of corruption. 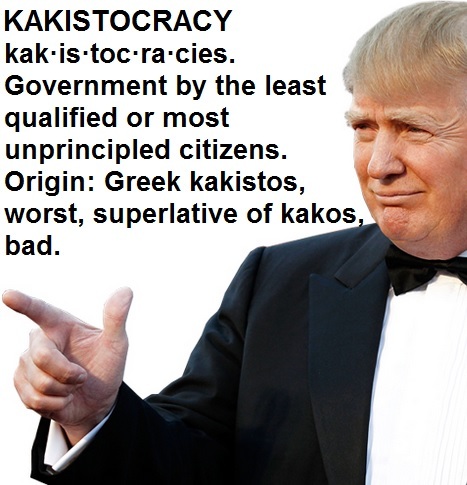 Daily Kos reports that within a week of his victory the president-elect has created a scheme to make money from foreign diplomats who want to curry favor. These "guests" are charged a fee to stay at one of Trump's hotels. A Vox article by David Roberts and Brad Plumer acknowledges the gravity of the threat posed by the incoming administration. As stated in the article, "Most people are wildly underestimating what Trump’s win will mean for the environment." While the president-elect may not be able to stop the clean energy revolution, he can undermine American leadership and make it impossible to achieve the goals set out in the Paris Agreement. Trump will increase America's greenhouse gas emissions and make it impossible for the world to stay within the upper threshold temperature limit. Like most environmental groups the Sierra Club's Michael Brune has promised to fight the climate-killing efforts of the Trump administration, however, he conceded that "This could be devastating for our climate and our future." Now is the time to sound the alarm about the seriousness of the climate crisis not to look for silver linings. In a Triple Pundit article, Emilie Mazzacurati points to the "good news" that financial markets offer. Growth in the low carbon economy is being driven by businesses and investors, however, in the absence of government support these market forces are unable to auger the scale of change we need to see. Trump's plan to double down on fossil fuels pushes even the remotest hope out of reach. Being hopeful is one thing, but being disconnected from reality is another. As we face the implications of a Trump presidency, now is not the time to abandon unwarranted optimism in favor of the kind of pragmatic realism that enables us to do the most with the tools that we have at our disposal. We need to explore every recourse within the law to slow Trump's climate-killing agenda. A Think Progress article by Joe Romm (who almost always seems to get it right) referred to, "a turning point in the history of climate action," and then he asked, "Will Trump go down in history as the man who pulled the plug on a livable climate?" He answered his rhetorical question with the following warning: "The fate of humanity is in the hands of a denier who pledged to kill domestic and global climate action and all clean energy research." What the Trump administration does and doesn't do will have consequences that are "irreversible on a timescale of a thousand years." Romm concludes by laying out the painful truth, "the damage and delay that even a one-term President Trump could do will make the already difficult task of keeping total warming well below 2°C essentially impossible."